The Texas Longhorns season had gotten off to a rough 1-4 start before today&apos;s game versus their rivals, the #10-ranked Oklahoma Sooners. After one of the team&apos;s players and fans alike tweeting their disgust of the abysmal start last week, there are plenty of adjustments that had to be made. This even includes the replacement of their beloved Longhorn mascot Bevo XIV, who is out sick and couldn&apos;t attend the game. So what did they do? They let a dog out! (WOOF!) They took a dog and put fake horns on its head to pose as their stand-in mascot today. It&apos;s simple ain&apos;t it? But quite clever. Gotta love their pride in being makeshift patriots, because the show must go on. And they weren&apos;t going to let their rivals push them to a 1-5 record in the Red River classic. They shocked the Sooners today 24-17, and they even carried their coach Charlie Strong off the field. 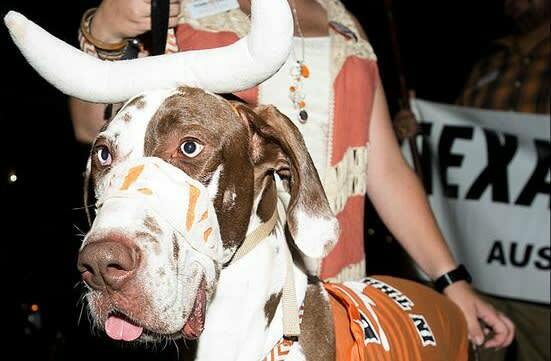 Maybe this horned dog was the Longhorns&apos; good luck charm. To achieve a winning record by the end of the season, and for Coach Strong to keep his job, they are going to need all the luck they can get.